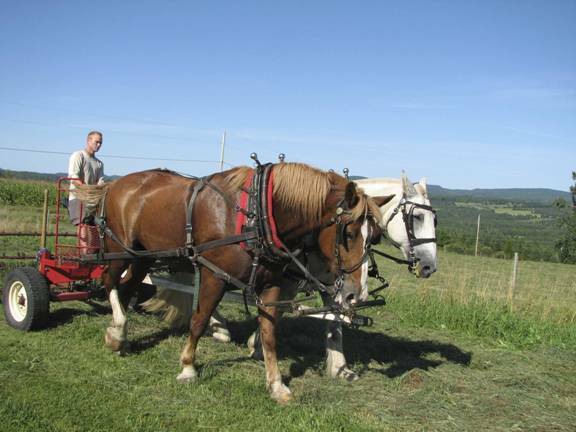 Craftsbury Common, VT – Do you have a desire to take the mystery out of draft horse tillage, raising a family cow, or growing organic veggies? How about permacuture? As the subject of organic farming becomes nationally discussed, with the advent of CSA’s and Michelle Obama digging up the White House lawn, Sterling College in Craftsbury Common, Vermont offers for the 3rd straight year, its summer Sustainable Agriculture Semester. What may be the nations only full semester in sustainable agriculture is aimed at high school graduates, college students, and adult learners. The 15 credit semester has two sessions running from June 1 to August 14. Students live on Sterling’s northern Vermont campus complete with organic gardens and farm. The schedule includes hands-on training, field workshops to local farms, and visits to national farming conferences. Students also participate in, and reap the benefits of, Sterling’s 15 year-old farm to table collaborative. Tucked in the midst of Vermont’s Northeast Kingdom, Sterling is one of the nation’s smallest, fully accredited, liberal arts colleges with a student body of 100. The Northeast Kingdom, also small in population, is fast becoming a hub of local food and farming initiatives – making the Sustainable Agriculture Semester both timely and appropriately placed. Visit www.sterlingcollege.edu/sas for more information or contact Paul Ferrari at 802.586.7711 ext 147. Nestled in the northern Green Mountains of Vermont, Sterling College utilizes its setting as a natural laboratory offering Bachelor of Arts Degrees in Sustainable Agriculture, Conservation Ecology, Outdoor Education & Leadership, and Circumpolar Studies. Sterling graduates are changing the face of sustainability in rural and urban centers around the nation. Sterling’s focus on experiential education – the philosophy of educators engaging students through direct, hands-on experience – is emphasized inSterling’s motto, “Working Hands, Working Minds.” Academics are an integrated aspect of daily life, both in the classroom and outside in nature and the community. Sterling has a student body of 100, a student to faculty ratio of 7:1, and an average class size of 10. Twenty-five percent of all food served is grown or raised on Sterling’s organic farms. The main campus has 130 acres of woodlands and pastures, with 300 acres of Boreal wetlands. Sterling is close to world class hiking, biking, ski mountains, and many other recreational opportunities.